When it comes to choosing the right wine for a gift, even the most passioned wine aficionado face the same dilemma – still or sparkling wine. There are dozens of tips on how to choose wine for certain occasions, including on which wine to pair with which food, so you can match your choice with the occasion. However, there are only a few people who truly know the difference between wine, sparkling wine, and champagne. Most people choose to play it safe and usually get a white wine that goes with anything. Riesling, for example, is a very popular choice. Even though there are multiple factors that determine how to choose the right wine, including the alcohol content, acidity, type of grape, it is often recommended to just ditch dilemmas and choose the wine that best suits your taste. Forget about getting Champagne just because it is appropriate for the occasion, or maybe a bottle of Cabernet Sauvignon just because you can’t miss the Black Friday sales. When it comes to picking the right wine, just buy one that you’re sure to drink. 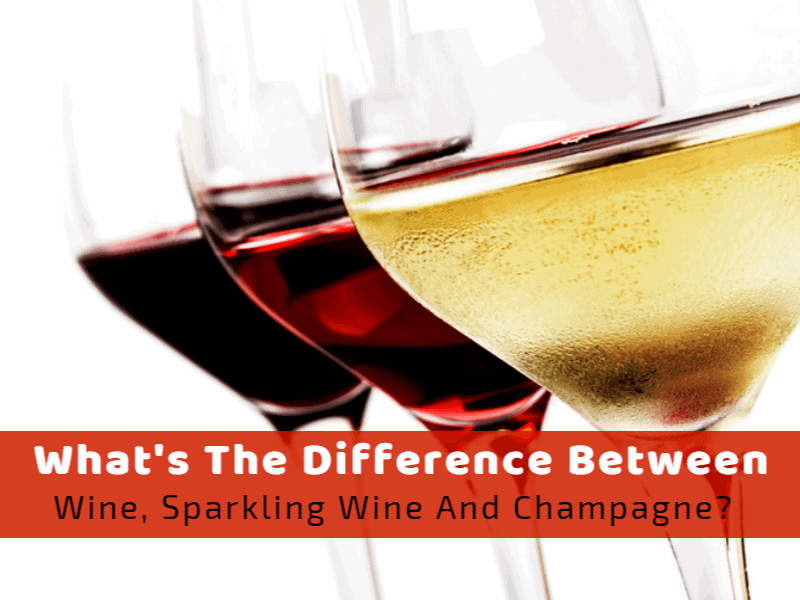 Then, read on to learn what is the difference between sparkling and still wine. Many believe Champagne is the only sparkling wine in the world when in reality, there are countless sparkling wines, such as Australian sparkling Shiraz and Italian Brachetto d’Asti. The reason Champagne is the only sparkling wine referred to as ‘champagne’ is the region it comes from. This sparkling wine is produced exclusively from grapes grown in the Champagne region of France. Thus, contrary to popular belief, there are many sparkling wines produced in other regions of France, Italy, Spain, and Australia. Although these sparkling wines cannot be called ‘champagnes,’ they are mostly produced in the same way. Furthermore, they even have a similar aroma and flavor. That’s why up until recently, Champagne and other sparkling wines were considered luxury. However, with their growing popularity, many winemakers and retailers now offer sparkling wine at more than attractive prices. The main difference between sparkling and still wines is that sparkling wines have dissolved in them carbon dioxide. The bubbles effect is achieved during a second fermentation. During this process, winemakers add to the still wine a mixture of yeast and sugars which produces carbon dioxide. The end result is a sparkling wine. These wines may even have in them fruits other than grapes, such as apples, pears, citrus, strawberry, and inevitable cream and vanilla flavors. Because of their specific taste, sparkling wines are usually uncorked on special occasions only, such as engagement parties, weddings, anniversaries, or big sports and other TV events. However, this doesn’t mean there aren’t sufficient people who just enjoy a glass of bubbly wine after a full day at work. So, to conclude, which is best between sparkling and still wine? It is a matter of individual taste. Whichever it is, choose a wine that suits you best. But don’t let the bubbles fool you just because they are fancy. Although sparkling wine and Champagne both possess a refreshing effervescence, still wines have their charm and suit many occasions better than a bottle of bubbles. And now that you know what’s with the still wine and the champagne, perhaps you’d like to find more on what’s with the sparkling versus champagne. As said above, they are very much alike. More often than not, they are even produced with the same method and from the same blend of grapes. So, what’s with the fuss? To begin with, as mentioned earlier, the name of Champagne derives from the region the plant used to produce the drink is grown and manufactured. The conditions in which Champagne grows is another factor that weighs in the denomination of this beverage. Champagne grapes grow in a relatively mild climate with rich mineral soil which explains the reason behind the rich flavor contained in it. Although the ratios vary, about 90% of Champagnes use two thirds red and one third Chardonnay blends. To determine whether the wine is Champagne or sparkling, you need to classify the region of production. Whereas real Champagnes can be made exclusively in the homonym region in France and exclusively from seven different grapes, sparkling wines are not held to the same boundaries. Sparkling wine can be prepared from the same grapes as Champagne or from totally different blends. Sometimes, sparklings are even produced from one type of grapes alone, such as Prosecco which mostly consists of Glera grapes. The winemaking process used to produce sparkling wine used throughout the world. The emphasis, however, differs in various countries with the emphasis being on fruitiness, bubble size, and methods. Each country produces a distinct version. Here are are some of the popular grape wine produced in different regions. Sekt it is produced in Germany. Its sweetness and dryness vary. It is less alcoholic compared to Champagne. Prosecco it is an Italian sparkling wine with large bubbles and a fruity aroma. It is made from Glera grapes and Bianchetta Trevigiana. Cava it is a wine made in Spain from Macabeu grapes this variety is said to have a very similar flavor to Champagnes. French sparkling wine just like Champagne, it comes from France. Compared to champagne, sparkling wine is relatively cheap. This variance in price is influenced by the difference in quality as well as the methods used to make this drinks. If you are conscious about your budget sparkling wine is going to be mixed into other juices even though the quality will be greatly reduced you will spend less. The climate in the Champagne region of France affects the acidity of the grapes, which in turn influences their taste. Champagne contains three grapes; Chardonnay, Pinot Noir, and Pinot Meunier. The grapes are collected manually and immediately pressed. The three kinds of juice will then be blended and put in cellars. They blended juice then goes to the fermentation stage through a process known as a traditional method. Even though this process is considered the most labor intensive, it gives the champagne a yeasty character, crisp acidity, and biscuit aromas. Although the sparkling wine from California is also made using the traditional method it is fruitier than champagne since the grapes ripen longer in the warmer climate, explained Ray Isle, the executive wine editor at Food & Wine magazine. A bottle of prosecco goes for an average of $12 while champagne goes for $52 according to Brager. The price of California sparkling wines retails for approximately $22-$35 range. The Spanish sparkling wine follows the same traditional winemaking method used for California sparklers and champagne. The best Spanish sparkling wines, for example, Cava de Paraje, are thought to be comparable with sparkling wines from France. In fact, according to Tom Stevenson, a top champagne expert, Cava is one of the greatest sparkling wines in the world. Unlike the past when it was only served at fancy restaurants, the wine is now found in local restaurants or local liquor store. Its rise supply was the factor behind the steep prices. What Makes Champagne So Pricey? The price of a sparkling wine varies greatly, depending on how long it is aged. Champagne experts often say that time is money, but what do they refer to? The more time the wine stays in the cellars, the more expensive, it will be. Real estate is also a major factor in the prices of champagne. Land at champagne regions appreciates rapidly. Price is one of the most important factors that influence consumer decisions. According to the wine experts, there are good sparkling wines in the $10 to $15 range. In addition to price, wine drinkers should know the difference between vintage and non-vintage sparkling wines. Non-vintage wines consisting of a blend of two or more wines in one bottle are aged for a minimum of 15 months. The aging requirement for vintage wines is three years. Vintages are generally higher in price because production is smaller. Moreover, sparkling wine terminology can be tricky. “Brut” or “ultra brut” on a label means the wine is dry and “extra dry” or “dry” actually tastes slightly sweet. In general, people prefer dry wine. So, when it comes to choosing a still, sparkling, or champagne, which one to go for? It often depends on the occasion but my advice, go for whatever you like to drink. Wine is always a good choice, no matter what wine it is. Whether you prefer still red, white, or rosé, a glass of bubbles or a luxurious champagne, make sure you truly appreciate what you drink. Otherwise, knowing the difference is pointless!